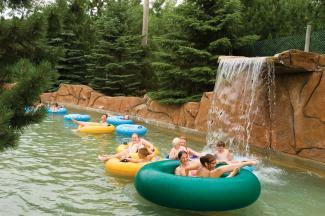 Located in south central Wisconsin, the small town of Wisconsin Dells has always featured stunning water attractions. In fact, the town draws its name from the dells of the Wisconsin River, a stunning glacial gorge that has attracted visitors for more than 100 years. 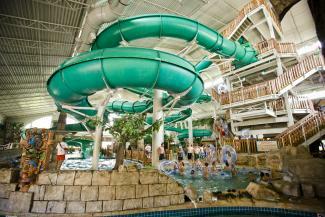 Today, however, the rushing rivers that are part of the town's numerous indoor and outdoor water parks are the biggest attraction, earning Wisconsin Dells the distinction of being the Water Park Capital of the World. A single day pass runs around $40, but if you plan on visiting multiple times, you may want to consider a season pass for around $70. The park is open Memorial Day through Labor Day. Indoor water parks are open year-round, available in all weather and typically are included with reservations at the hotel or resort surrounding the water park. While they have a limited range of extreme thrill attractions compared to the Noah's Ark outdoor parks, they can be enjoy year-round, even during the cold Wisconsin winters. Rooms start at just over $100 a night and you must reserve a room in order to access the water park. The resort is also home to an indoor amusement park with attractions such as a Ferris wheel, elevated go karts, laser tag, miniature golf, and a themed carousel. 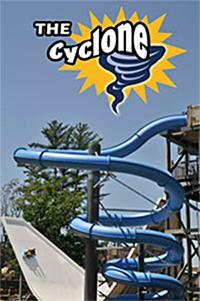 You may choose to stay at the attached resort or purchase water park passes separately. Passes may be purchased for the water park only for around $40 or for both the water park and indoor theme park for around $50. Spectators must also buy a $10 pass. Rooms at the hotel start at $64 a night and reservations are required for access to the water park. 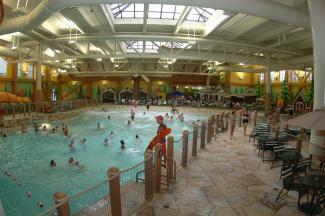 Some resorts offer both indoor and outdoor water parks for tourists to enjoy. The indoor water parks are open year-round, but from Memorial Day through Labor Day, you can enjoy both indoor and outdoor water fun at these parks. During the warmer months, you can play outside all day in the sun and still enjoy water park activities at night or on a rainy day. In most cases, facilities with indoor and outdoor water parks also offer lodging on-site so you can enjoy the water park the moment you step out of your hotel room or cabin. 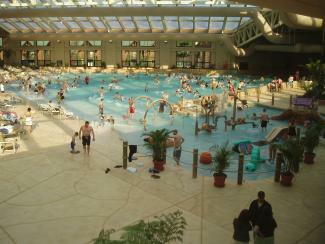 All water park activities are reserved for guests of the resort. Multiple lodging options are available, from rooms in the Wilderness Hotel & Golf Resort, Wilderness on the Lake or Glacier Canyon Lodge to renting villas, condos, and cabins within the Territory. Book a guest room or suite or rent a condo or villa so you can enjoy the water parks during your stay. The resort also allows guests to purchase day passes for around $30 a person without reserving a room. A basic double queen room starts at around $80 a night and reservations are required for accessing the hotel's water parks. A ticket for Mt. Olympus Water and Theme Park will set you back about $40. You do not have to be a resort guest to visit the park. Tickets are not included with resort reservations, but resort guests do receive a discount on their tickets. 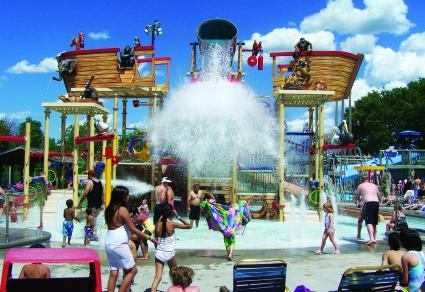 Put together, there are hundreds of miles of water slides, rivers, and other wet attractions at the Wisconsin Dells water parks. Guests may at first have a hard time choosing which park to visit or which attraction to brave, but the best advice of all for a fun, wet vacation is to just dive right in!